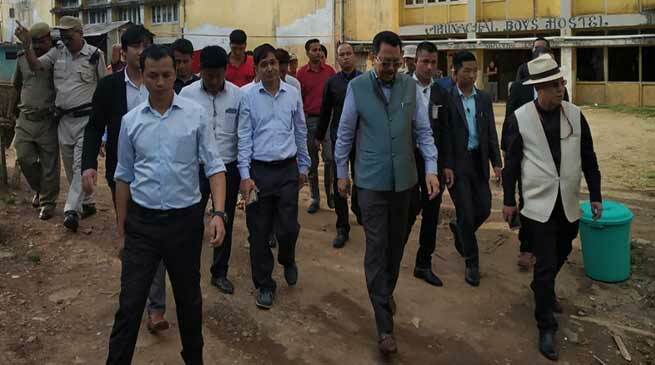 Dy CM, Chowna Mein inspected the Arunachal Bhawan, Circuit House buildings, Boys Hostel in NEFA building at Shillong. Deputy Chief Minister of Arunachal Pradesh , Chowna Mein who is here in Shillong to attend the review meeting of National Highways in the North East Region taken by the Union Minister of Road, Transport & Highways, Shipping and Water Bodies etc, Nitin Gadkari has inspected the Arunachal Bhawan, Circuit House buildings and the Boys Hostel in NEFA building here today. Interacting with the representatives of Arunachal Student’s Union Of Shillong (ASUS) present on the occasion, Mein said that the fund for complete renovation of Arunachal House at New Delhi has been provided and the process of tendering is on. He further said that the State Govt need to have its own Arunachal House in Guwahati too and the land has been demarcated with concrete boundary wall. He said that though the State Govt have created many infrastructures in other States but due to our own faults, we are not able to maintain it. He called upon the students to change their mindset & attitude and to be more discipline and maintain timings. He further said to look into the demands placed by the representatives of ASUS for renovations of Circuit House and Boys Hostel in NEFA building and also to bring the issues into the State Cabinet Meeting for discussion. He was accompanied by Commissioner PWD, Bilatee Pertin and Deputy Resident Commissioner, Shillong, Marge Sora during his inspection.